The pattern paper is from The Girlhood Stack from DCWV and the solid papers are all from Core'dinations. The frog is cut at 2.5" and the pattern paper is cut at 5 1/4" x 4". I printed the sentiment out using Word with a free font called American Typewriter. The sentiment is cut at 2" x 1" and mounted on a Cricut cut from that same cartridge cut at 2.5" x 1.5". I'm just starting to figure out all these little extras on these cartridges and I think it's making my cards look nicer. I also just picked up some White Jelly pens and have started using them to add dimension to my cuts. I just popped a little white dot in each eye of the frog and I think it adds a lot. 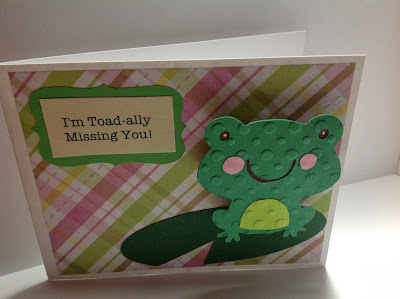 I'm going to see how many missing you cards I can get done this weekend and then get a small package shipped off to OWH.